Firm insanity. Mattress Firm that is. I blame Monday for my insanity, but that's a whole other story. Mattress Firms have been popping up all over town and I just don't get it. There are FOUR locations within two miles of my house. I could walk the loop of them easily in one afternoon. I'm talking BLOCKS away from each other. So I outlined the mall - that's all one block basically, so THERE'S ONE ON EACH CORNER! WHY ARE THERE FOUR SO CLOSE TOGETHER?! I live very close to what I would call the "shopping epicenter" of my town - it includes our large mall and several strip malls surround it that include all the must haves like Nordstrom Rack, Target, TJ Maxx, Ulta, Old Navy, Best Buy, Cabelas, DSW...I could go on and on. Plus a bunch of good eats and Dave & Busters and the connection of our two major freeways. So yes, it makes sense to have a store in the area. BUT FOUR?! I don't get it. It's like they are getting busy and popping out babies. 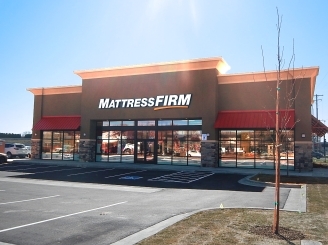 Does Mattress Firm hunker down 10 stores close together in your areas? Please tell me I'm not crazy. I'm not hallucinating all these branches of the same store right? That's all from over here in crazy land. Never heard of them. haha. Hahaha! That's kind of insane. I don't understand how mattress stores stay in business, to be honest. Mattresses aren't really an item that you buy regularly. Like, once you have a mattress, you're good for like 10-20 years, right? That is unreal! There is ONE near us, I can't imagine why there are FOUR?!! Haha! 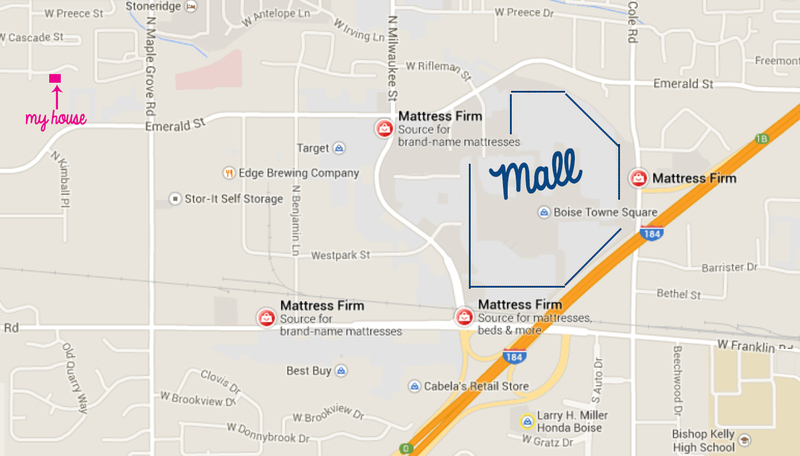 We have literally 20 mattress stores within 3 miles of me. It's absolutely stupid....but they make money! It's confusing. Now i'm going to have the jingle in my head all day! We have a ridiculous amount too, but I don't think we have that many so close together, that's crazy! 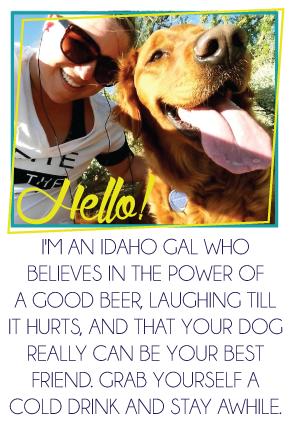 I'm with Jaelan, I don't get how so many of them can stay in business! I'm also just kind of mad at them right now because we had a Radio Shack move out of a space right by a Starbucks by us recently and I was hoping something really cute or fun would go into that space, and then a Mattress Firm moved in. Could there BE a more boring store?? How can they possibly sell that many mattresses to need so many so close together?!?! We have one in each of our shopping areas...but just one. Not four! Omg... I had to google it because we have a bunch too. I live on exit 13 and there is one. On exit 14 there are 3, two of them being .1 of a mile from one another. Lol... literally who is buying all of these mattresses???? I always wonder how business survive when they do stuff like this? Like how CVS built next to Walgreens constantly. How does that work with demand? Especially with mattresses since people buy them at MOST every 7 years.